Few names are more central and more important to the Facebook / Cambridge Analytica privacy story than Chris Wylie. Over the last 5 years, Chris's path as a data scientist lead him from his native Canada, to the head of research at SCL Ltd - a contractor developing military ‘information operations’ for the US and UK - to the top of a (then) little-known company named Cambridge Analytica. It was at Cambridge Analytica that he met Steve Bannon and began helping to pioneer their 'propoganda machine' designed to use social media to propel Donald Trump to the presidency in the 2016 election. To train the machine, they first concentrated it on the Brexit vote. This year, Chris came forward as the key whistleblower in the case and we were delighted to host him speaking on stage at In:Confidence 2018. Chris was joined for the extended interview by leading data privacy journalist and former Guardian and Observer Researcher Harry Davies, renowned for breaking the original story back in 2015. The pair took a deep-dive into the news storm that brought data privacy roaring onto the front pages, and became a pivotal moment in the public’s digital consciousness. 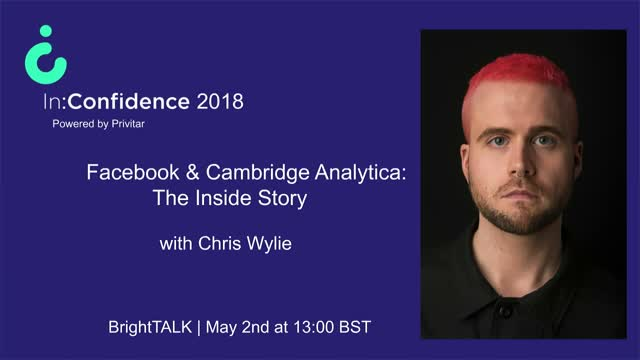 Exclusive to BrightTALK, this session features Chris Wylie the man at the centre of the Facebook / Cambridge Analytica data privacy scandal giving the inside view; how we got to where we are now and suggesting what the industry can do moving forwards to prevent another damaging privacy breach. Data is changing the world. We are faced with incredible opportunities to use data for good, but it has to be done in the right way, with respect for the customer. The risks of not protecting customer privacy are significant. Get data privacy wrong and your customers will quickly turn on you and you will face significant regulatory fines. Jason will also explore the results of the Privitar Privacy Pulse 2018 - an extensive survey of business and consumer attitudes towards data privacy. Every industry is undergoing a data driven revolution. The use of data is making companies innovate faster, make better informed business decisions, find efficiencies, and understand what their users want and how to deliver it for them. Often the data used is sensitive and personal, so a by-product of this greater use of data has been a growth in the risk to individuals’ privacy. Individuals and regulators are increasingly concerned and have started demanding better protection of individuals’ data. De-identifying data can reduce the privacy risk associated with processing it, whilst preserving much of the data’s utility, but effectively doing so can be a complex process and one of uncertainty for many organisations. This interactive session will explore some of the key considerations and best practices organisations should employ when looking to de-identify personal data. Privacy matters to your customers. 9 out of 10 consumers believe that technological advancements pose a risk to their data privacy – but 64% of businesses believe that they could miss out on a competitive edge by not making the most of their data. How can you reconcile the two? This session will unveil the results of a wide-ranging data privacy survey, during which we asked 5,000 consumers and 1,500 B2B leaders across the UK, US and France for their thoughts on data privacy and data protection. The webinar will feature experts from industry, policy and academia discussing the issues raised by the results, and their implications for your business. This will also be the chance to ask a panel of industry-leading professionals your data privacy questions, so please do register now to join the conversation. The key learnings from the report will also be available as a ready-to-download attachment for you to access and share. There is significant digital transformation going on across the healthcare sector, driven by exciting new technological developments including machine learning and advanced analytics. Healthcare providers are looking to use data science to dramatically improve clinical outcomes and create operational efficiencies across the healthcare system, however making data available for this purpose is challenging given the sensitive nature of the information. - The significant value of healthcare data and ways it can be put to effective use. - The mechanisms can you put in place to protect sensitive patient data and unlock its value. Join this interactive session to understand how healthcare data can be used and the privacy controls that you need to put in place to ensure it's sufficiently protected. Sensitive information about individuals can be recovered from different types of data releases, including aggregate statistics or machine learning models. This session will address the privacy risks in publishing analysis results and introduce data privacy techniques to defend against them. Theresa Stadler, Data Scientist at Privitar, will explain differencing and reconstruction attacks on simple summary statistics such as count tables, along with discussing the privacy risks of supervised machine learning. Many organisations are stripping themselves of the power to put their own data to use, thanks to legacy systems, complicated internal processes and privacy concerns. This interactive panel session will cover how to unlock the value of your sensitive data, to ensure that it's being used effectively and efficiently across the enterprise. Comment renforcer la confidentialité des données dans un contexte de risque et de nouvelles obligations? Privitar est une plateforme logicielle centrale de gouvernance de la confidentialité des données permettant non seulement de répondre à certains enjeux de la GDPR mais également d’avoir une approche fonctionnelle de “Privacy by Design” sur des cas d’usage précis. La plateforme Publisher vous permet de livrer à la demande ou en streaming des jeux de données anonymisées par des techniques de masquage, de perturbation ou de généralisation tout en conservant l’intégrité de vos données sensibles. Il est également possible d’insérer des filigranes invisibles afin d’auditer l’origine d’une donnée en cas de fuite de fichier et ainsi de protéger votre e-réputation. Ce webinar soulignera en premier lieu les obligations du contexte GDPR pour ensuite se concentrer sur l’illustration concrète de deux clients. Il s’achèvera par une démonstration de la solution. Il est important de noter que nos solutions s’insèrent dans vos environnements Big Data et facilitent ainsi le développement de processus analytiques sans compromettre la valeur des données et en respectant la confidentialité due à vos clients et utilisateurs. This webinar is part of BrightTALK's Privacy Insights Series. Audience members are encouraged to send questions to the speakers to be answered during the live session. This panel, from In:Confidence 2018, hosted by Privitar's Rob Anderson discusses the relationship between privacy and security, and how the two disciplines need to work together to achieve success. The words privacy and security are often used interchangeably - as both seek to protect information - but they are unique and complimentary disciplines, which each need respective levels of focus. The session looked to define the relationship between the two and how they need to align and work hand in hand. Security protects data against unauthorised access; privacy protects sensitive data in use within an organisation. Security is quite mature; privacy is an emerging discipline. Security is a technical field that has grown over several decades. Recognised security standards exist, and are maintained by an active community, with vetted security protocols in use everywhere. This is not yet the case for privacy. But if FB/ CA has taught us anything, it's that you definitely do need both. It was a fascinating discussion, from an industry-leading selection of speakers. Make sure to tune in and catch the session on-demand. This session is taken from In:Confidence 2018, where Olivier Penel debated whether privacy will one day kill innovation. On one side, the dramatic breakthrough and widespread adoption of Artificial Intelligence (AI) technologies create many opportunities for companies to innovate and to create value with data. On the other side, increased privacy concerns and regulations bring new standards and rules in the way personal data should be used. - What will be the impact of the GDPR on data-driven innovative projects? - How can organisations use GDPR as a catalyst to accelerate their digital transformation journey and boost innovation? GDPR has now come into effect, but how will it affect innovation moving forwards? Tune in to find out. This panel, from In:Confidence 2018, hosted by The Exponential View's Azeem Azar discusses considerations for privacy as the world of AI rapidly grows and develops. The panelists looked to explore several key themes including the rise of AI; what it means for the consumer; considerations for data privacy and upcoming risks and opportunities for growth. It's an engaging debate, from an industry-leading selection of speakers. Make sure to explore the content. This session from In:Confidence 2018 will provide a brief history of privacy-by-design and it's relevance to the recently-come-into-effect GDPR. George follows his introduction to privacy-by-design with a deeper dive into privacy design strategies, and concrete privacy enhancing techniques (PET's), along with touching on privacy on the block chain. George Danezis is Professor of Security and Privacy Engineering and head of the Information Security Group of the Computer Science department at University College London. He is also a faculty fellow at the Turing Institute. His focuses include computer security, privacy, and in particular anonymous communications, traffic analysis, statistical inference, smart metering and peer-to-peer security. He has a special interest in the application of modern machine learning to security problems, as well as distributed ledgers. Post-Cambridge Analytica / Facebook the use and misuse of personal data is high in the public’s mind. But what does the story mean for data and our perception of how it should be controlled and owned? At In:Confidence 2018, the Open Data Institute’s Jeni Tennison made the argument that digital privacy rights require individual consumers to have ownership of data about them. Yet Personal data is often about multiple people, not just one, adding to the complexity of the debate around data ownership. Jeni questions whether a prospective future where we benefit from our decisions being informed by data while being protected from any harmful impacts is realistic. And how contributing to, developing and promoting a global rights framework for data might seem like a hard journey, but it is one we need to make if we are to use data to build a better future and better society for everyone. The data ownership and privacy debate is more relevant than ever. Tune in and explore as Jeni delves into the key talking points. Many traditional enterprises - banks, telcos, retailers, pharma companies, government organisations - are complex in their makeup, and this complexity extends to data and how data is used. This video, from In:Confidence 2018 features Privitar CTO Jason McFall discussing the early days of big data. How organisations collected and stored all and any information, because it wasn’t yet clear how useful it could be, or what the possible uses might be in the longer term. Practices like this created vast and murky data swamps, upping the risk of data breaches and making regulatory compliance harder to manage. So, rather than risk significant privacy breaches and the associated fines, many are choosing to play it safe by simply not using data at all. This is risky business too because companies will inevitably miss out on huge opportunities to innovate, create competitive advantage and stay relevant in a fast paced world. The words privacy and security are often used interchangeably - as both seek to protect information - but they are unique and complimentary disciplines, which each need respective levels of focus. This session will look to define the relationship between the two and how they need to align and work hand in hand. Security protects data against unauthorised access; privacy protects sensitive data in use within an organisation. Security is quite mature; privacy is an emerging discipline. Security is a technical field that has grown over several decades. Recognised security standards exist, and are maintained by an active community, with vetted security protocols in use everywhere. This is not yet the case for privacy. But if the Facebook / Cambridge Analytica story has taught us anything, it's that you definitely do need both. Maturity: What can Privacy learn from the maturity journey of enterprise Security? Emerging roles: Whose job is Privacy and Security respectively? What job titles are emerging and what do their job descriptions look like? Is there such a thing as a privacy culture? Ethics: Would it be advisable for data scientists to have a code of ethics? should they do ethics training? Transparency: consumers are concerned about the way businesses are using their data. But do they care about the distinction between privacy and security? On May 25 the long-awaited General Data Protection Regulation (GDPR) will go into effect across Europe. GDPR is the biggest overhaul of data protection laws in more than two decades. How prepared is your organization for GDPR? - Why should you be GDPR-compliant? - How to achieve compliance? Punit Bhatia, DPO and author - be ready for GDPR. I am Jason du Preez, CEO and co-founder at Privitar. We are a London based software company leading the global adoption of privacy engineering software. I think it's important to understand how the public's perception of data privacy has changed very significantly over the past five years. The average citizen has become aware of this power imbalance that exists between organisations that have data and data subjects; and as a result, when we evaluate products and services, as we engage with companies and organisations, they way they manage, secure and protect our data, it's actually something that comes to the top of mind when making those decisions. To take advantage of this opportunity, organisations really need to know their data, to put transparency over how that data is processed, and because the sheer of volume and complexity of the information, we need to be able to leverage technology controls. And if we are extracting value from data, an important insight is that, we can now disambiguate the economic value in data and harmful identifiying factors in the information. This is where privacy engineering can play such as vital part in the process. The world is waking up to privacy risk and privacy harms. There is a clear realisation that unless we incorporate privacy into every aspect of the data supply chain we run the risk of impeding innovation and exposing customers to harm. Privitar’s mission is to promote and facilitate the ethical and safe use of valuable data assets. Using leading privacy engineering techniques, we help companies get maximum value from data while preserving customer’s privacy.